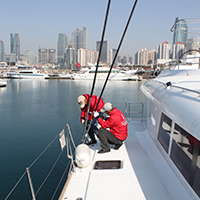 A good boat preparation is the most important job for the safety and performance of a boat. Therefore we conduct our commissionings with the highest care and professionalism and with high quality imported materials. 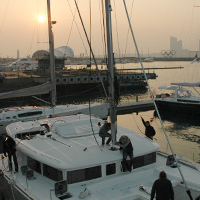 Our technical team will review the boat entirely in every detail, preparing her thoroughly to guarantee that she is in full function, safe and beautiful. Naturally we are also able to provide other kind of preparations, for shows, events or performance racing. We take good and professional care of boats. The attention we provide will extend the life of your boat and ensure smooth and safe boating. Our team of experts can offer you the best maintenance packages available. 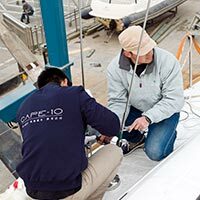 With CAPE-10’s boat preparations and maintenance packages, repairs will be minimized and planned. If unplanned breakdowns or emergencies happen with your boat we are at your full disposal to help solve them as quickly as possible. Call our technical team as soon as you discover some problems or have any questions and we commit to address your inquiry within 72hrs. Contact us for technical questions or inquiries or call our service hotline: 400 696 82 96.